Uplifting Books | Free Christian Books delivered by Postal Mail! FREE Christian Books delivered to your door! If you prefer, you can go to our Download Free Books page where most of these book titles are available for free to download in ePub, Mobi & PDF. 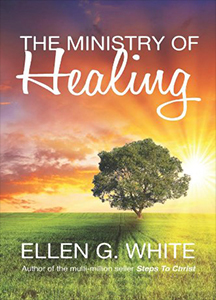 The Ministry of Healing is written in clear, simple, beautiful language; full of hope to the despondent, a message of cheer to the sick, and a rest to the weary. For over one hundred years The Ministry of Healing has conveyed its helpful message to millions of readers in many different countries of the world and in many different languages. This book presents to us a better way; it reveals the path to a simpler, sweeter life, full of joy and happiness. The thoughts in this little book will lead you on a journey of discovery – The journey of a lifetime! You will get to know your creator a little better, feel the depth of His love for you, and realise how worthwhile you are to Him. He is ready to accept you just as you are, and is able to cleanse you and give you hope for the future here, and also by His saving grace, hope for a life beyond your wildest dreams forever. Bible Readings – Bible Questions Answered provides the answers to all of your Bible questions straight from the Bible itself. This book has helped millions of people in their study of the Word of God. 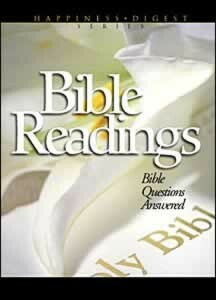 Get the answers to your pressing questions directly from the Bible. You will quickly see how this book can transform your Bible study into a fascinating and enlightening experience! 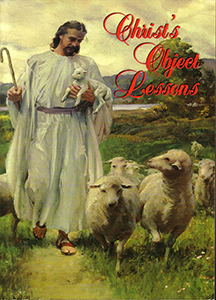 ‘Christ’s Object Lessons’ is a companion volume to ‘The Desire of Ages’; presenting the parables of Jesus in a fresh light. This wonderful book offers a deeply spiritual understanding of the parables of Jesus Christ as they apply to our life today. The author presents these timeless truths in a manner that can be easily read and understood. 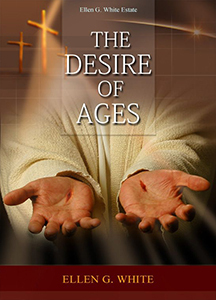 ‘The Desire of Ages’ is the life story of Jesus Christ, and has brought inspiration and enlightenment to millions of readers all over the world. And with good reason, for it deals with a universal yearning – the desire for living life to its fullest with the knowledge that we are here for a reason – that we are loved. In the heart of all mankind, of whatever nationality or position in life, there are longings for something we do not now possess. This longing is implanted in the very heart of man by his Creator God. Man cannot be truly happy while he is separated from the God who formed him, and gave him the gift of life. The Bible is like no other book in the world. It is abundantly evident that it is the Word of God. No other religion has a book filled with prophecies fulfilled one after another. Bible prophecy is astoundingly accurate in every detail. No human being could ever predict the miraculous prophecies that are found in the Bible. God alone has the power to foretell the future, and then bring it to pass: The Bible must either stand or fall according to the fulfilment of the remarkable prophecies it so boldly makes. The trustworthiness of God’s Word is at stake. God has embedded prophecy in His Word to prove that He is indeed God – He can foretell the future. Fulfilled Prophecy is God’s Challenge to the World! Prophecy Speaks will astound you as it details many of the amazing prophecies to be found in the Bible and shows from history their stunningly accurate fulfilment. Why do so many innocent people suffer? Why are there so many problems in the world today? Why is there so much violence in our society? Why have major earthquakes, floods, storms, and other natural disasters in the world increased? 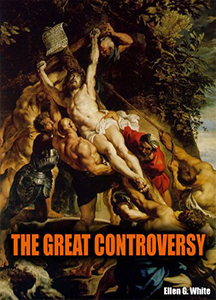 The Great Controversy will answer all of these questions for you once and for all! We are really enjoying these books, they are a blessing. Thank you and God Bless. Thank you! This is a great thing you’re doing! I received my amazing books yesterday. God bless you. Thank you so much. Just a thank you for the package of books you sent me, much appreciated! Thank you so much, I received the books few days ago. It is so amazing that you guys give out those books free. May the Lord continue to bless you and your team. I just want to let you know that I picked up a copy of The Path to Peace in a caravan park laundry in Alice Springs. I am a Christian and really enjoyed reading the book. I left it there for someone who may not have Jesus in their life. I commend you on this very readable publication and would like to order 5 more copies to place in waiting rooms in my own town. May you be blessed as you bless others with the distribution of the word of God in everyday language. I want to thank you for the beautiful books you guys have sent to my father and I. We received them today in the mail. The books are incredible. I recently ordered a free bible which I received and are most grateful for this. I have just added an order for another 3 bibles as i'd really like to give one each to my children as well. I cant thank you enough for my precious gift. I love the bible it's the best gift you can ever give. I have just finished reading The Acts of The Apostles that you sent me. Never have I gained such knowledge of the Bible since reading this book and Patriarchs and Prophets. I thank you for these books. I will be starting The Desire of Ages tomorrow. I hope I find you well, you are my angel of learning, you have helped me so much. I’ve been planning to buy a Bible for a few weeks now until I saw this free offer. I just want to say a huge thank you to uplifting books on the behalf of everyone for the resources you have provided us. Wishing you all the very best, and keep evangelising! Thanks for the free inspirational books. If any way I can get more that will help so I can share with others too. Thank you so very much - may God bless you awesome people abundantly! Hi Bless You All! GOD is Good! I've run out of supplies again ha ha. The word is getting out there! Could I please order 4 bundles of these beautiful booklets again? I leave them at our local shop and they are being read! Thank you so much. Love always, Katrina. Hi Everyone!!! I'm still trying to spread the word 🙂 Can I please order a few bundles of books again? I found a free stand to place these in at one of the local shopping centers and they've been going one by one!!!! I have some to place in there tomorrow with a few left for a glass covered community notice board. Praise JESUS, Amen! Thanks so much. Bless you all. Thank you very much for my very own bible and the personal note that made me smile. God bless you all abundantly too. Good evening Uplifting Books, Today we received our Bibles, pamphlets and your lovely note. We are so excited! Thanks so much! God Bless! Returned home to a Holy Bible waiting in the mail for me. What a blessing, absolute euphoria I must say. The lengths you guys are going to spread the word of God is great and commendable! God bless your cause! You guys are great. Thank you so much for the Bible and wonderful books. I’m learning so much and feel so much closer to God. Thank you so much. I have been in the wilderness for a few years now but feel God is calling me back into His fold, thank you for the opportunity to receive a Bible and Christian books. At present I do not receive any income, God's Blessings to you. Thank you so much for my free bible and other free books. I love them and feel so blessed. Thank you. I received the books today with a wish inside! It was just a simple thing but lightened up my day. Thanks for doing this! All the best! These books are wonderful. Thank you so much. My books just arrived this week and I just want to thank you for these books, they're incredibly helpful. May God bless you abundantly too. Hi there, I would like to thank you immensely for sending me a free Bible in the post this week. I appreciate it immensely and I have shared your business address with many other friends in the hope they also make use of your generous and kind offer. People like yourselves are what makes the world such a good place. Humanity and warmth when times are down. Congratulations and please keep up sharing your happiness with people in the community. Good luck and keep smiling, warm regards David. Dear Uplifting Books ~ I want to thank you so much for these books to further my studies of the Bible. I appreciate it so much. I am looking so forward to especially reading the book on "healing". I have many health issues and a lot of pain all the time. But Our Lord is going to heal me. So thank you again and keep on helping others to get nearer to God. That is what he wants. Bless You All. In Jesus Name. I'd like to thank you for everything that God has instructed you to do. Thank you very much! First of all I would like to take this opportunity to thank you for this wonderful offer. The books I have ordered and received are so inspiring. I recommended this site to family members so they could order their copies. 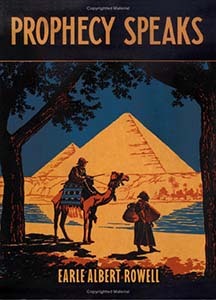 My question is, when will Prophecy Speaks book be available? I really would like to have the book. Again, thank you. Dear Uplifting Books, How good is Jesus ... today I was feeling flat and a lovely surprise came in the mail. Thank you so much. I needed a new Bible. I needed a new reading plan. I need the Ministry of Healing book, and I was excited to receive The Great Controversy. I just wanted to let you know how much I appreciate your wonderful blessing. May the great Lord enrich you with even greater blessings. Cheers. I feel so blessed to have come across this website, and I am amazed by the wonderful books you offer. Hi, I'd just like to say thank you for sending me the "Bible Readings" and"Prophecy Speaks" books also the "Prophecies of Daniel and Revelation" comic. I'm enjoying the comic because as a cartoonist myself, I like looking at things that are set out in picture form. Thank you once again, kindest regards, Brian. I received my parcel. Thank you so much I'm so grateful. I am at last stage of giving up drugs and reading books and Jesus helps. I would just like to thank you so very very much. I am so so excited to have the reading material so I can become closer to my savior. You truly don't know how much I appreciate what you have done for me. I have asked forgiveness from God for anything I may have done in the past. For things that I may have done and didn't know I have done. I know that my walk with the Lord needs to be a lot stronger. I want to thank you again, and I hope in the future if there is any other materials that you think will benefit me, and I have not received, I hope you will send them to me, and as I finish them I will pass them on to a family member. Thank you again for the best gift I have been given. I would like to thank you so much for the books you kindly sent me, they are very inspirational to me. They contain hope and truth. if there are other materials that I may have, I will appreciate them wholeheartedly. I am not much of a writer. You are the first person I have written to in years. I am very appreciative of the free Bible and books, and I was wondering if I can get a few more books from you. The ones I have I love, they are so easy to understand. After recently relocating interstate and unpacking I came across your 'the path to peace' booklet which I've just finished reading and is very well written. It has encouraged me to want to know more about your writings on Jesus Christ. Many thanks. I believe it is by divine providence that I found a copy of your booklet 'the path to peace' which has given me great insight into God's unconditional love and has transformed not only my mind but my heart. I don't think the book can be read in one sitting, and so I have made it my 'good companion' whilst waiting in doctor's offices with my aging mother. I have thoroughly enjoyed reading it that waiting no longer bothers me as in the past. 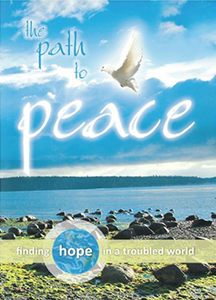 I would like to request for 5 copies of 'the path to peace' which I intend to share with loved ones in the hope that they too can be set free from unforgiveness which hinders them from receiving the peace that everyone longs for. In addition, can you also please send me 'The Desire of Ages' book if there is any left in stock. May the Lord bless your ministry by placing the books in the hands of those who are searching for the truth and a deeper understanding of God's love so we can truly reflect the God whom we love to others. Thank you for this great opportunity. God bless. I can't thank you enough. God bless the wonderful work you people do! I have been troubled all my life, and have been searching for some sort of peace, and I was hungry for something spiritual to fulfill my inner self. And so I want to thank you because since reading your book The Path to Peace, I have a purpose and belonging now, whereas before I couldn't find any reason to go on. I just didn't want to be on the earth anymore. But now I have accepted that God has a purpose for me, and I have given my life to the Lord. I am contented. What a wonderful offer you have for no cost. I am deeply grateful. Your booklets are an inspiration to me and others! I received my parcel today, and I couldn't be more impressed by the time and effort that went into wrapping and even having a hand written message. I'm so glad that I have found Uplifting Books cause now I can provide some to my nieces & nephews 🙂 It's never to early to expose the youth to the word of God. The timing couldn't be more perfect for me to start my new journey with Christ. Thank you Uplifting Books for spreading joy and smiles. Thank you so much for the gift of books sent to me. I now have a wealth of reading matter to study. Your generosity and kindness is much appreciated. I have thoroughly appreciated 'The Path to Peace' and I wish to supply a copy to each of my 4 sons. All the materials you promised to send have arrived and I've been reading. When I placed them all on my table, I realized what a treasure of gifts you have given me. My heart is full of gratitude and much appreciation. No words can tell you how happy I am, only tears of joy knowing that someone far away loves me. I will stay in touch and please continue to whisper a prayer for me. I pray Christ will give you much strength and happiness today and always. Thank you so very much.